cOntrast designs is a multi-disciplinary design studio practicing in the fields of architecture, planning and interior design. 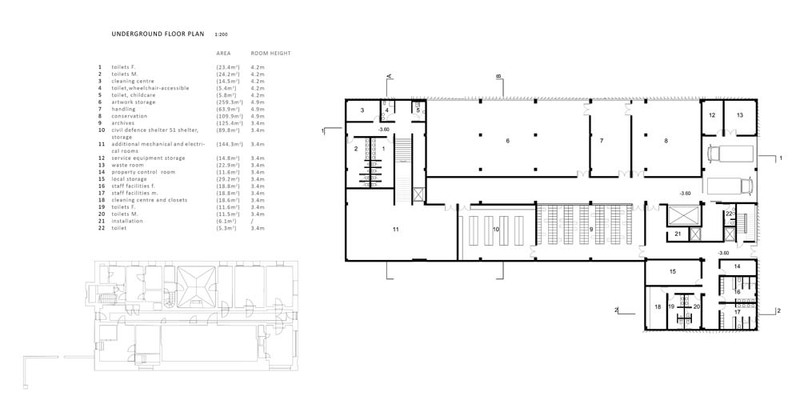 It is led by 3 architects/designers practicing in Cairo, Kareem Hammouda, Mazin A.Karim, and Tamer Nader. Besides producing contemporary architecture and urbanism , they also focus on cultural analysis , critical investigations and the production of ideas. 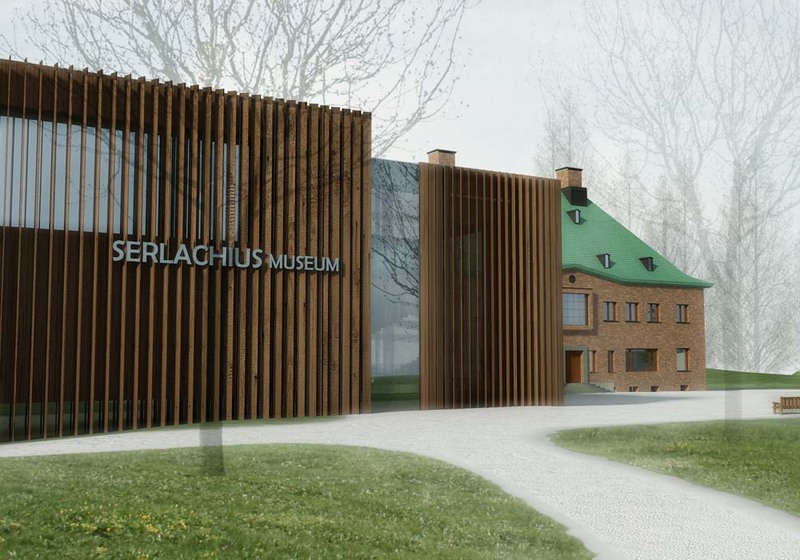 The competition was for a new extension to an existing complex of buildings, the serlachius museum complex, to accomodate a larger amount of displayed art work through temporary and permanent gallery spaces. The competition results were announced a few days ago. 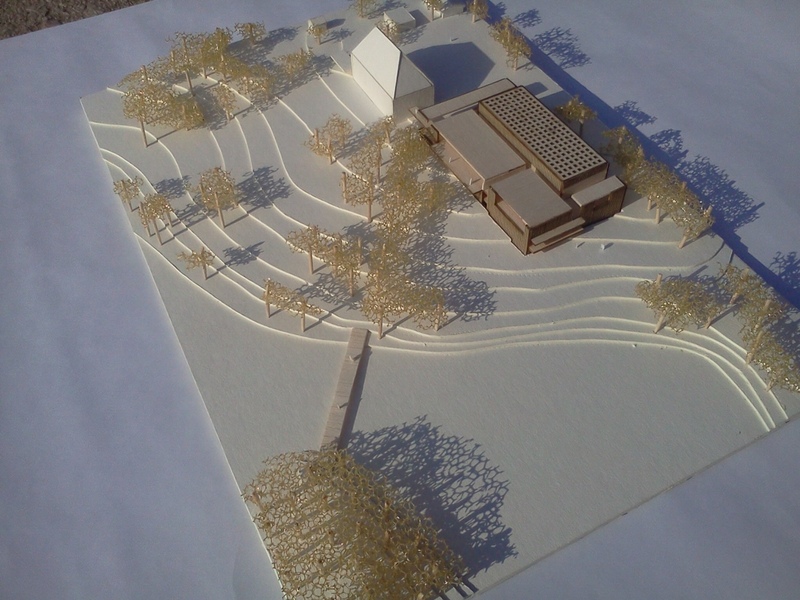 We did not win this time, but here is our complete proposal. 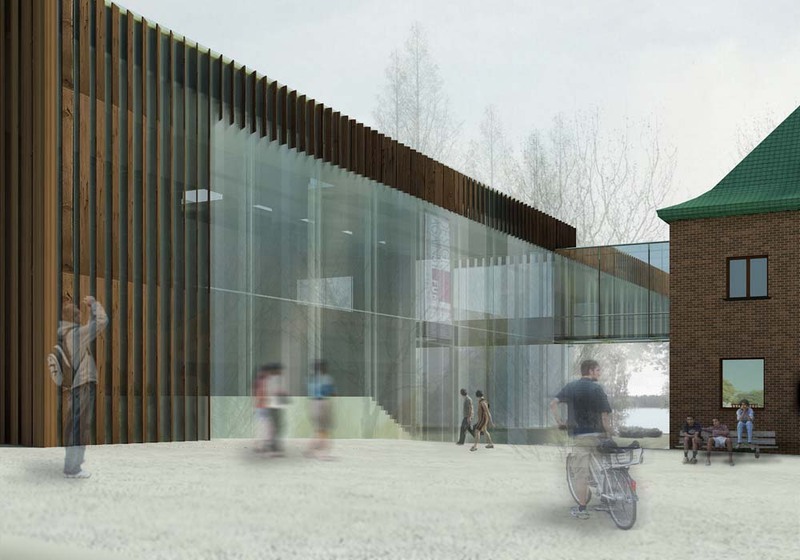 Where, in the past, a great idea and the dedicated work of Gustaf Adolf and Gösta Serlachius sent out some leading impulses to the art world of Finland and beyond, the Museum extension building is now to send out new impulses to both of scenes, art and architectural. The old and the new, the past and the present, the then and now are all to be linked together in an innovative manner, creating an extension to the institution that is to be at the centre of the Nordic art scene. The volumetric composition of the new building consists of components of different heights that are connected in a whole that consists of individual but well integrated parts. The idea to make a whole out of elements comes as a reference to the present character of the immediate surrounding that could be perceived as an ensemble of architectural and vegetal sedimentations over time. Moreover, the act of densification of mass results with a compact form that is highly advantageous in terms of ecology and therefore sustainability. This rationale enabled an organizational plan where internal programmatic applications are interwoven on many composition levels, thus allowing spatial synergies of various intensities. Major programmatic strong-points that are catalyst of public presence, apart from the exhibitions spaces, are all oriented towards the southern perimeter of the building where the panoramas over the surrounding landscape are extraordinary. 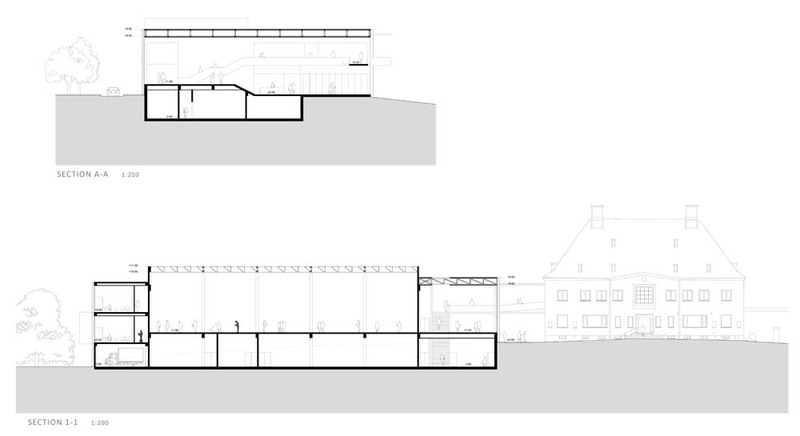 In the exhibition spaces, the interior is concealed from the exterior thus creating a world of itself. 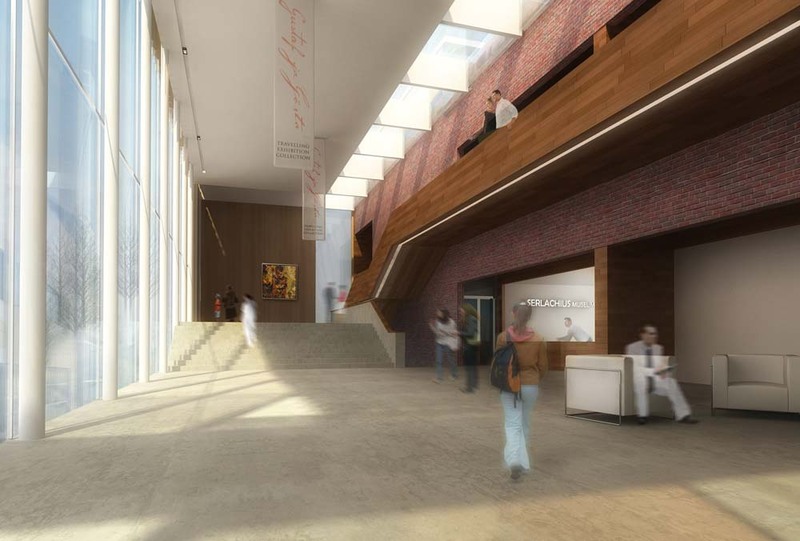 As symmetry, the foyer is largely open and orientated towards the surrounding natural habitat, thus creating a duality of atmospheres that are to be experienced by the museum visitors. 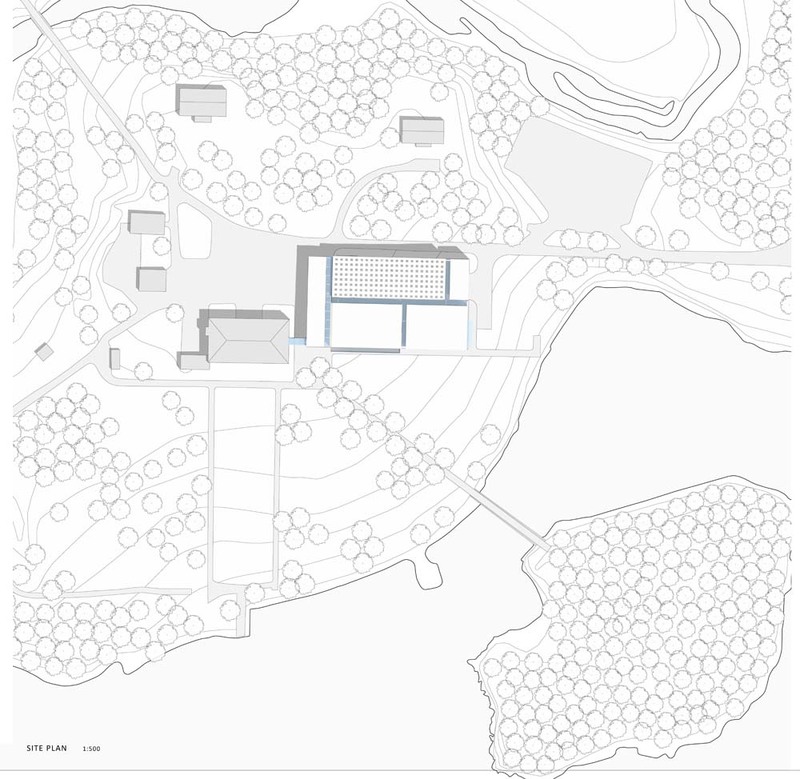 The new building stands confidently alone where its northern border is parallel to the service road and the building is stretching down over the eastern slope, as far as half the way down to the clean lake bay. 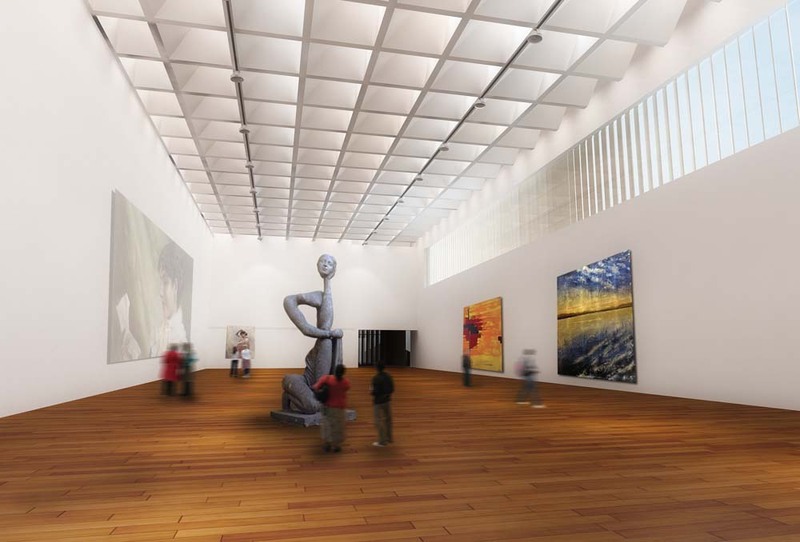 Consequently, the museum extension building fully respects the disposition of the existing plants that are found to be one of the greatest values of the immediate context. 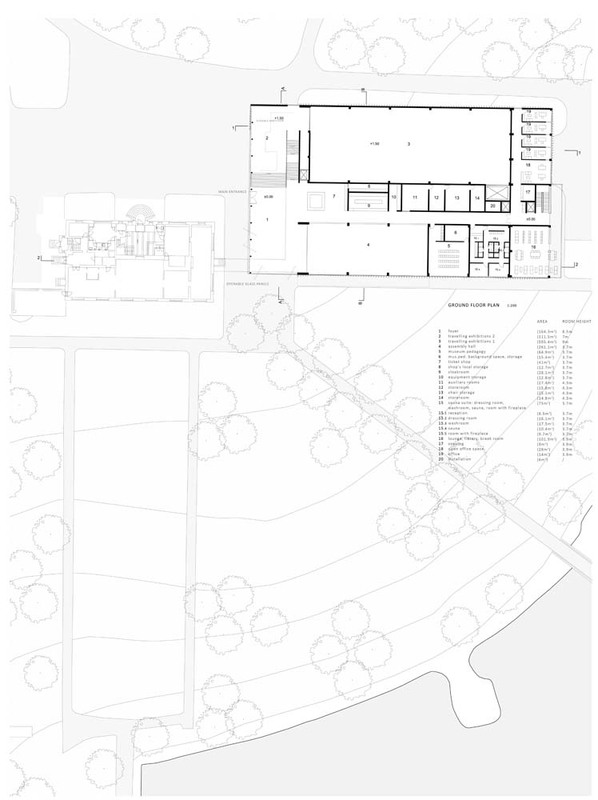 Regarding mass distribution, the eastern volume of the building houses the foyer, becoming the central space of the complex aiming to achieve a volumetric balance with the Joenniemi Manor. 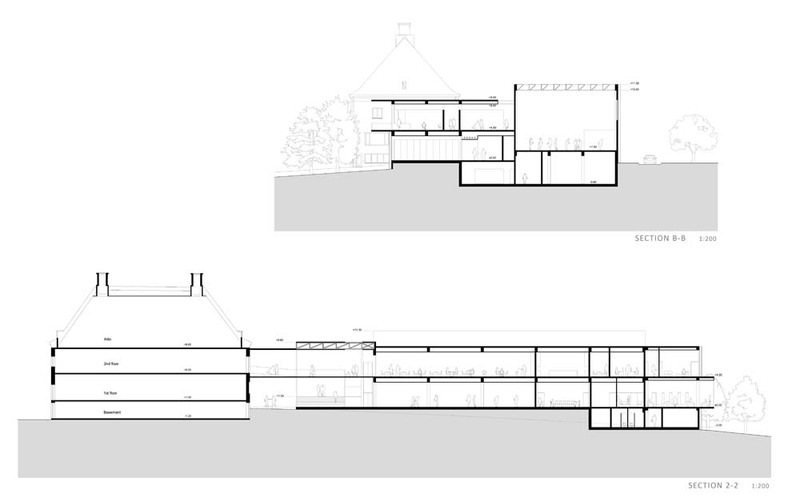 The height of its grounded brick base volume is respected and the foyer rises up to that point only. By this decision, the “new” demonstrates its respect to the “old” and establishes a dialogue with it. In order to establish a further relation to the Joenniemi Manor, the eastern wall of the foyer respects and follows its materiality, and is too rendered in brick. Thus, the foyer unites several independent spatial areas and frames them by the two parallel walls made with same material properties. The panorama between them is formed by the nature itself as the southern envelope of the foyer is a massive glass wall that is in direction of the lake. 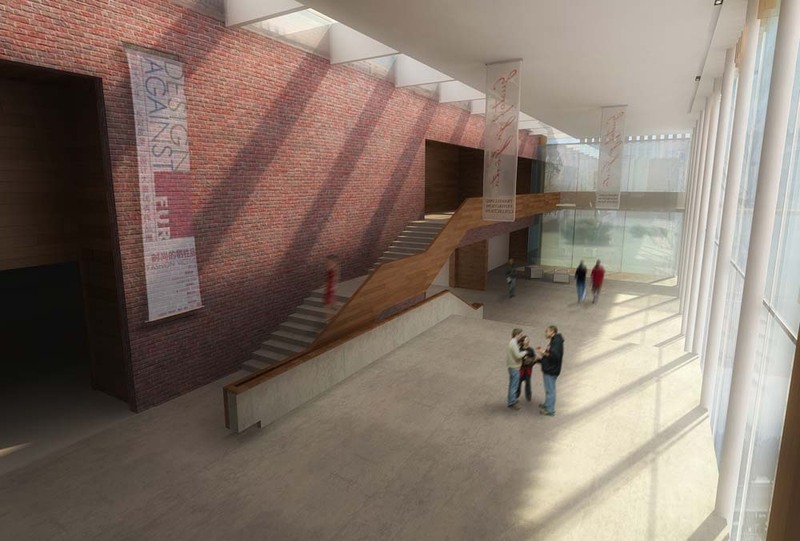 In the mixture of the materiality of the brick together with the massiveness of the walls, and in the contrary to the undisturbed view towards the landscape, the foyer could somehow be perceived as a space that is a hybrid of city and landscape. Apart from glass windows, the rest of the outer surface of the building is made of prefabricated vertical blades made of wood. 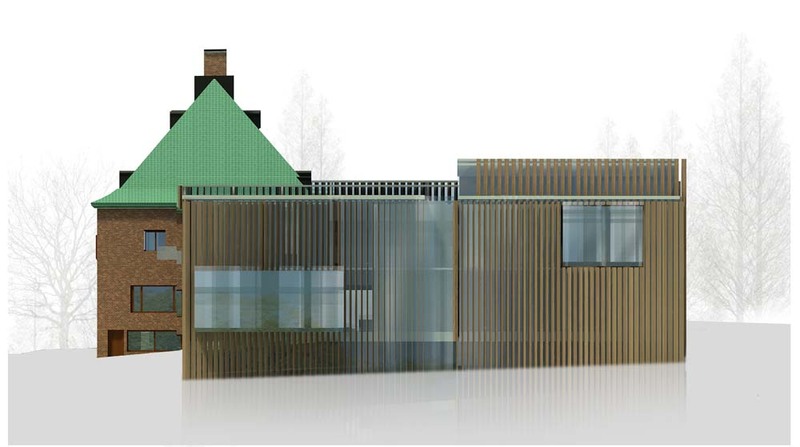 Their purpose is to ensure a better control of the natural light, but also to establish a better volumetric and material relation to the surrounding context. By the act of distortion of the surface, the necessarily big mass of the building becomes somehow scale-less as its size is hard to compare to the other elements in the landscape. The surface is abstract and created by irregular rhythms and its vibrations are in relation to the constant movement of nature, which is yet another narrative that is to be exploited in establishing a more context sensitive building. The result is a rich and dynamic building whose appearance is contemporary but also “light” enough not to interfere with the existing architectural environment. 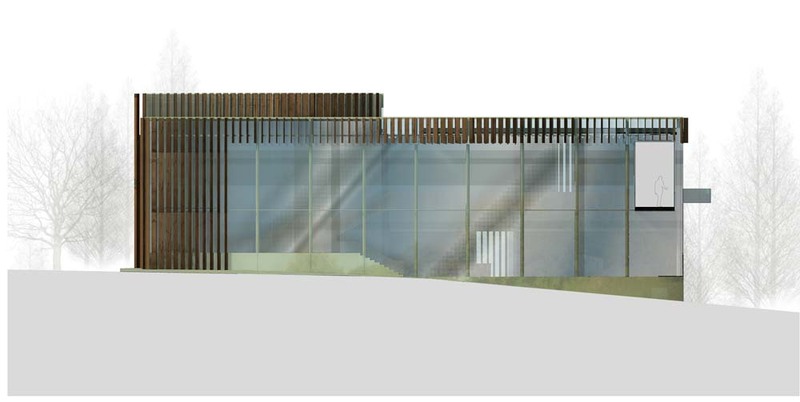 The roof façade is perforated in order to introduce the desired lighting for the exhibition spaces. The system of roof openings consists of single repetitive prefabricated element that allows the desired quality of lighting into the exhibition spaces. The roof is also used as a productive surface as its great floor area is used for planting photovoltaic panels that will ensure a clean and sustainable energy. The integration of the building within the highly precious existing landscape was one of the major concerns of the project. Thus, the existing topography is fully respected and the interventions to it are minimal. The positioning of the building was done carefully and according to the great respect to the existing trees and only few of them are to be relocated in case of construction. 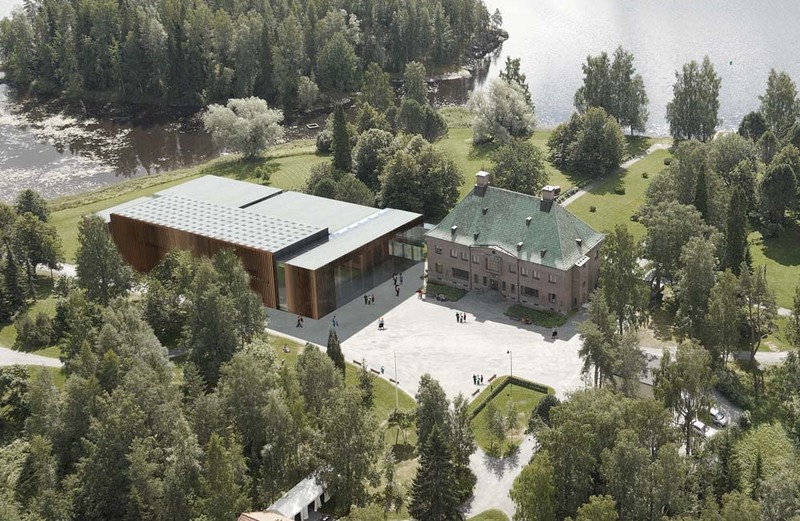 As the connection between the Joenniemi Manor and the new building is established at their first floor levels, the museum extension footprint doesn’t disturb the pedestrian path that in the north-south axis is connection between the central square and the lake. The system of pedestrian paths is extended to the eastern side of the site where path finishes at the water border. The bridge that once connected the island with the mainland is to be reconstructed and later integrated in the patchwork of pedestrian routes enabling visitors to enjoy unrestricted movement through the site. The building is rational and efficient in many ways. It is firstly the compact form of the building that makes its ecological footprint highly efficient. In that sense, the mass compactness guarantees an optimal relationship between external surfaces and mass, whiles the very careful use of glazing (apart from foyer), ensures effective thermal comfort and limited dispersion. The structural system is clear and rather conventional and its simplicity will potentially enable a great reduction of building costs, an issue that is obviously very high in the agendas of the foundation.